Dating back to the 12th century, Amners Farm has been part of a rich local history, the current farmland being part of the Englefield Estate. The farm today is run by Chris and Wendy Webber and under their tenure had grown into a diverse business. The farm itself has approx. 360 acres of arable and grassland, with some of the original farm buildings converted for alternative use. These buildings now house a small number of diverse businesses. With the close proximity of the M4, the farm also offers an attractive location for DIY livery, offering stabling, excellent riding and schooling facilities. Unusually, the farm also has a miniature railway run by a group of enthusiasts, the track weaving its way around the beautiful farmland and is known as ‘Amnerfield miniature Railway’. This traditional farmstead has already opened its doors to the public, twelve years in succession, by hosting lambing weekends. These are annual events, with wide ranging activities and attractions, and usually take place the last weekend in April and first weekend in May every year. In the first instance, for all general enquiries, please contact the farm office. This is manned 9am-4pm Monday to Thursday, however there may be occasions when commitments elsewhere on the farm, mean that the office is not manned for short periods and in these circumstances, please leave a message on the answering system and we will call you back upon our return. 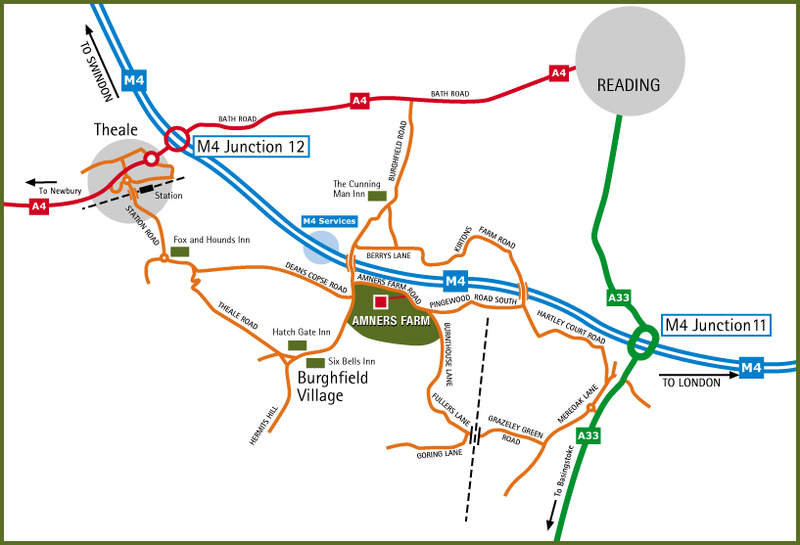 Amners Farm is located near the village of Burghfield, just outside Reading in Berkshire, between Junctions 11 and 12 of the M4 corridor.